The SpeedSwitch switches a user on or off at a pre-set speed or RPM. Connection to an electronic speed or RPM signal in a car. 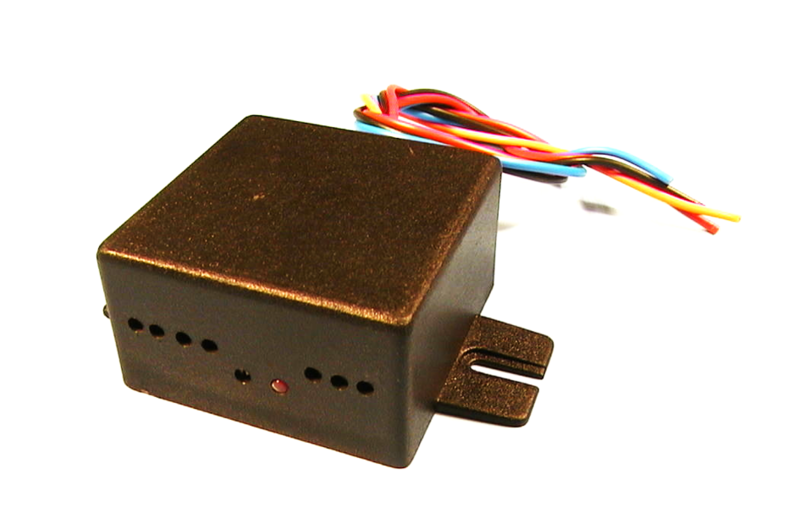 The SpeedSwitch is a universal automotive interface that can be used for both 12 V and 24 V power supply. Initially developed for navigation systems (to suppress speed pulses that arise in some cars when the car is actually at standstill), we have further refined it into a versatile interface. In short, the SpeedSwitch can switch a user on or off at a preset speed or RPM. This fact, combined with a built-in make-andbreak contact makes the SpeedSwitch suitable for a variety of applications. One of the applications where one can use a SpeedSwitch is the carjacking function: for automatically locking all the doors by activating the existing central locking system with the SpeedSwitch as soon as the vehicle starts moving. Thus when the vehicle is at standstill, it will not be possible for a miscreant to open the door, pull out the driver from the car and drive off. It will also be more difficult to open the tailgate and remove goods when the vehicle stops at a traffic light, for example. This aspect is particularly salient for courier services. There is a rising trend for installing built-in back-bumper assisted-parking systems in the front bumper as well, whereby such systems can be automated with the help of a SpeedSwitch. Although a assisted-parking system in the rear bumper can be easily activated by putting the car into reverse gear, it will be necessary to have separate controls to operate a similar system in the front bumper. The SpeedSwitch can, for example, interrupt the loudspeaker of the assisted-parking system when the car reaches a speed above parking speed (when the SpeedSwitch activates the power supply of the system instead of the loudspeaker, an unpleasant initialisation sound will be triggered whenever the assisted-parking system is switched on), thereby making the on/off switching of the assisted-parking system fully automatic. It is also possible to activate a buzzer or lamp at a specific maximum speed, for example as an application in earth-movers and agricultural machines. The SpeedSwitch is equipped with a multi-gang potentiometer for setting the switching frequency, and a control LED that indicates the switching moment. For the various applications, the SpeedSwitch is equipped with various relay outputs, a filtered signal output (API) and the possibility of connecting an external switch, whereby the SpeedSwitch can be set to ON, OFF or AUTOMATIC (standard SpeedSwitch function). The SpeedSwitch is also equipped with two frequency ranges. In general, for a speed circuit, the low frequency setting (Position 1) shall be used. If the SpeedSwitch is used for a speed regulation/tachometric circuit, in which higher frequencies often occur, the high frequency setting (Position 2) may be used. The SpeedSwitch is made of carefully selected high-value SMD components, which ensures a high level of accuracy and reliability. The SpeedSwitch has passed all the tests that investigate whether it disturbs other systems in the vehicle, and has also been awarded e4 certification as per EU Council Directive 95/54/EC. The SpeedSwitch is an indispensable article with which you can fulfil your client’s demands!